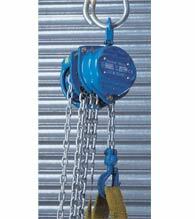 Hook Safety - Ensure safety catches are engaged and load chains/cables are untangled and hang freely. Sling Lifting - Do not use "load" cable/chain as sling. Prevent hook overcrowding, with a "bow" shackle. Join lifting equipment with a "D" shackle. Protect sharp edges to prevent load damage. Stable Load - Ensure load is balanced & personnel stand clear. Attach "tag" lines to control rotation. Never leave equipment unattended. Ensure unobstructed landing site accepts equipment plus load in size & weight. Vertical Lifting - Use only for vertical lifts. Position or suspend equipment from a safe point to take weight of load and equipment. Heavy manual lifting made easy: our comprehensive range of manually operated hoists are among the lightest for the load capacity on the market making them perfect for a wide range of situations from factories, workshops and garages to building and civil engineering sites.